Nelson Lakes National Park is located in the South Island of New Zealand. It was formed in 1956 and covers some 1,019 square kilometres (393 sq mi). It is centered at two large lakes, Rotoiti and Rotoroa. The park also includes surrounding valleys (including Travers, Sabine, and D'Urville, upper reaches of the Matakitaki) and mountain ranges (Saint Arnaud Range, Mount Robert). The park is a popular area for camping, tramping and fishing. The park is administered by the Department of Conservation who operate a Visitors Centre in Saint Arnaud that provides up to date and reliable information on all aspects of the National Park. The main access point to Nelson Lakes National Park is at Lake Rotoiti and the village of Saint Arnaud, on Highway 63, about 100 kilometres from both Nelson and Blenheim. A secondary access point is at Lake Rotoroa, turning off New Zealand State Highway 6 at Gowanbridge. Shuttle services operate between St Arnaud, Nelson, Blenheim and Picton. The main campgrounds are on the shores of Lake Rotoiti; there is a smaller campground at Lake Rotoroa. There is a network of tramping tracks throughout the park. Tracks range from short nature walks at Lake Rotoiti and Lake Rotorua, to multi-day backcountry tramps. Day tramps include the Lake Rotoiti circuit, St. Arnaud Range and Mt. Robert. The most popular long-distance tramping routes are the Travers-Sabine Circuit and other loops through Lake Angelus. The skifield on Mt. Robert is no longer operational. Rainbow Ski Area is located on the eastern side of the St Arnaud range, just outside the park. Other activities include mountaineering, boating and fishing, and mountain biking. See the DOC web site for more information. Nelson Lakes National Park contains 20 Department of Conservation huts, ranging in quality from 'basic hut/bivvy' to 'serviced hut'. The Rotoiti Mainland Island consists of 5000 hectares of beech forest around Lake Rotoiti. There is a project which aims to eliminate introduced pests such as stoats, possums, wasps and rodents, and allow recovery of the forests and native wildlife populations. ^ "Data Table - Protected Areas - LINZ Data Service". 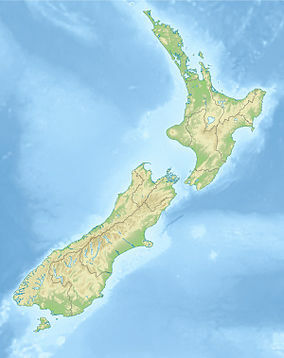 Land Information New Zealand. Retrieved 2017-10-18. Wikimedia Commons has media related to Nelson Lakes National Park. This page was last edited on 12 August 2018, at 05:29 (UTC).